These specifications apply to the PXI-6551 with 1 MBit, 8 MBit, and 64 MBit of memory per channel. If the PXI-6551 has been in use, it may exceed safe handling temperatures and cause burns. Allow the PXI-6551 to cool before removing it from the chassis. All values were obtained using a 1 m cable (SHC68-C68-D4 recommended). Performance specifications are not guaranteed when using longer cables. Typical values are representative of an average unit operating at room temperature. 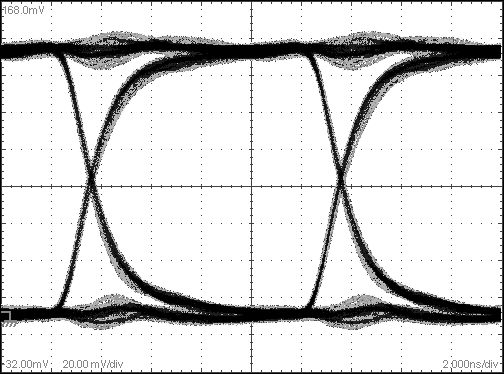 This eye diagram was captured on DIO 0 (100 MHz clock rate) at 3.3 V at room temperature into 50 Ω termination. Provided setup and hold times account for maximum channel-to-channel skew and jitter. Refer to Acquisition Timing in the Timing section. Refer to Generation Channels in the Channels section. Refer to Generation Timing in the Timing section. The PXI-6551 uses Synchronization and Memory Core (SMC) technology in which waveforms and instructions share onboard memory. Parameters such as number of script instructions, maximum number of script instructions, maximum number of waveforms in memory, and number of samples (S) available for waveform storage are flexible and user defined. Generates a single waveform once, n times, or continuously. Generates a simple or complex sequences of waveforms. Waveform must be an integer multiple of 2 S (samples). Acquisition triggers must meet setup and hold time requirements. Markers must be placed at an integer multiple of 2 S (samples). Driver support for this device was first available in NI-HSDIO 1.0. NI-HSDIO is an IVI-compliant driver that allows you to configure, control, and calibrate the PXI-6551. NI-HSDIO provides application programming interfaces for many development environments. NI Measurement Automation Explorer (MAX) provides interactive configuration and test tools for the PXI-6551. MAX is included on the NI-HSDIO media. To ensure that the PXI-6551 cools effectively, follow the guidelines in the Maintain Forced Air Cooling Note to Users included with the PXI-6551 or available at ni.com/manuals. The PXI-6551 is intended for indoor use only. The SHC68-C68-D4 shielded cables must be used when operating the PXI-6551. EMC filler panels must be installed in all empty chassis slots. 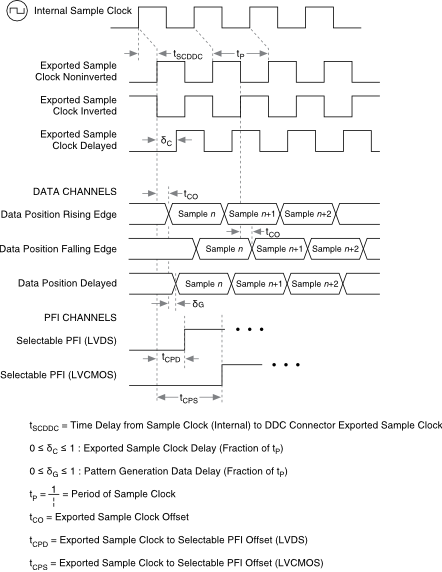 1 For all data, CLK OUT (Sample clock only), and PFI channels: while you can only set one voltage low level and one voltage high level for all generation channels, you can set a different low voltage low level and voltage high level for all acquisition channels. You can also set the channels to the high-impedance state (tristate). 2 Up to 50 MHz clock rate. 3 For module assemblies C and later. Module assemblies A and B have an input impedance of 10 kΩ. 4 While you can set only one voltage low level and one voltage high level for all acquisition channels, you can set a different voltage low level and voltage high level for all generation channels. You can also set the channels to a high-impedance state (tristate). 5 Measured with 50% duty cycle input signal. 6 Does not include system crosstalk. 7 Software-selectable per channel when powered on and within valid range. For module assembly revisions C and later. Module assemblies A and B have an input impedance of 50 Ω nominal or or 10 kΩ (default). 8 Diode clamps in the design may provide additional protection outside the specified range. 9 You can apply a delay or phase adjustment to the On Board clock to align multiple devices. 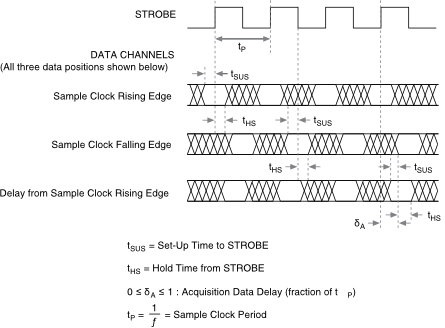 10 Sample clocks with sources other than STROBE can be exported. 11 20% to 80%, typical. 12 Required at both acquisition voltage thresholds. 13 Includes maximum data channel-to-channel skew. 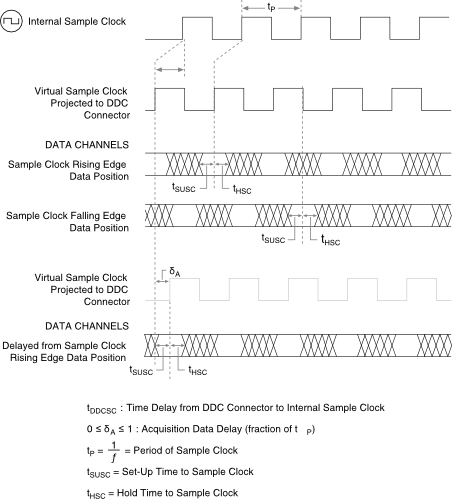 14 Does not include data channel-to-channel skew, tDDCSC, or tSCDDC. 15 Required at Vrms mean. 16 At the programmed thresholds. 17 Required at both acquisition voltage thresholds. 18 For module assemblies C and later. Module assemblies A and B have an input impedance of 50 Ω or 10 kΩ (default). 19 STROBE cannot be routed to DDC CLK OUT. 20 The source provides the reference frequency for the PLL. 21 Maximum limit for generation sessions assumes no scripting instructions. 22 Use scripts to describe the waveforms to be generated, the order in which the waveforms are generated, how many times the waveforms are generated, and how the device responds to Script triggers. 23 Regardless of waveform size, NI-HSDIO allocates waveforms into block sizes of 32 S of physical memory. 24 Sample rate dependent. Increasing sample rate increases minimum waveform size. 25 Regardless of waveform size, NI-HSDIO allocates at least 128 bytes for a record. 26 Each trigger can be routed to any destination except the Pause trigger. The Pause trigger cannot be exported for acquisition sessions. 27 Use the Data Active event during generation to determine when the PXI-6551 enters the Pause state. 28 Except for the Data Active event, each event can be routed to any destination. The Data Active event can be routed only to the PFI channels.